As part of the elite 101st Airborne paratroopers, Lt. Lynn "Buck" Compton fought in the critical battles of Normandy and Market Garden and in the freezing cold of Bastogne. Easy Company, immortalized as the Band of Brothers, stands today as an unparalleled icon of brotherhood and bravery under fire.Here, Compton tells his own story for the first time, revealing how the skills, work ethic, and discipline he learned as a young man served as the foundation for the courage and selflessness he displayed during the deadliest conflict of the twentieth century. From his years as a two-sport UCLA star who played baseball with Jackie Robinson and football in the 1943 Rose Bowl, through his legendary post&ndash;World War II legal career as a prosecutor, in which he helped convict Sirhan Sirhan for the murder of Robert F. Kennedy, Compton truly embodies the American dream: college sports star, esteemed combat veteran, detective, attorney, and judge.This is the true story of a real-life hero who traveled to a faraway place and put his life on the line for the cause of freedom-and an insightful memoir about courage, leadership, camaraderie, compassion, and the opportunities for success that can only happen in America. 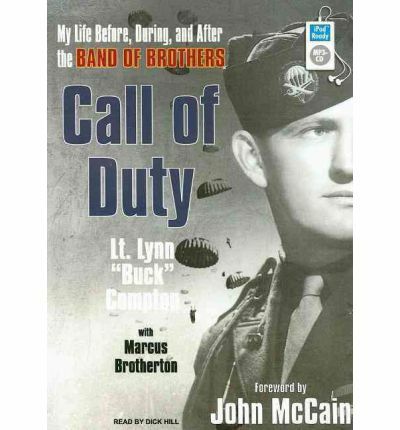 This is the story of Lt. Lynn "Buck" Compton of Easy Company, immortalized as the Band of Brothers, a real-life hero who traveled to a faraway place and put his life on the line for the cause of freedom. About the Author: Marcus Brotherton worked in youth ministry for nearly a decade before switching to writing fulltime. He holds a master's degree in practical theology from Talbot Seminary. Note: This Talking Book is in mp3-CD data format. This signifies it will only play on CD players specifically prepared to run mp3-CDs. It also can be installed onto a pc or mac and copied over to assorted mp3 players and played on them.